The implementation of LED lighting caused difficulties in audio transmission of the microphones. Furthermore, the CBS had repeatedly range problems with the established microphone infrastructure. In a first step, all small and middle-sized lecture rooms will be equipped with the SpeechLine Digital Wireless microphone system. 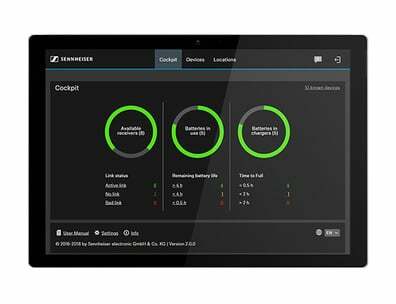 By the year 2020 it is planned to have all auditoriums shifted to the digital transmission technology of Sennheiser. "Handling is extremely easy, the products work perfectly. The transmission range is also excellent and the capacity of the integrated rechargeable batteries has so far been sufficient for every event." 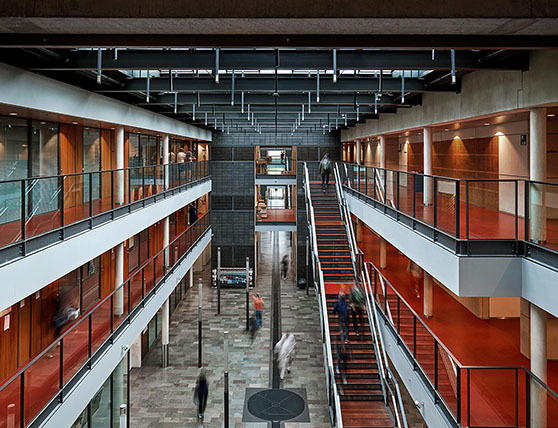 Copenhagen Business School (CBS) is installing SpeechLine Digital Wireless microphone systems in its rooms. The AV manager of Denmark's second largest Business School appreciates the simple handling, wide transmission range and lack of frequency problems. The gradual installation of state-of-the-art LED light technology into more and more lecture theatres is a factor speeding up the digitization of microphone systems at Copenhagen Business School. Profile CBS is by national and international standards a strong institution with a distinctive ‘business university’ profile. "It was kind of like visiting an Ikea store," says Jens Nielsen, AV manager at Copenhagen Business School. "We actually ended up buying something different than originally intended," he says with a smile, adding that he doesn't regret the investment decision. Jens had his first moment of delight with his new purchase immediately after setting up the SpeechLine Digital Wireless receiver and unpacking the first microphone. Jens Nielsen chose the standard range setting and went outside. The microphone transmitted his voice into the room without any problems at all, "across a distance of 25 metres through a concrete wall", Nielsen reports. "That was a very impressive start," he admits. The world's first wireless microphone system designed specifically for speech has been convincing the experts at the public university in the Copenhagen district of Frederiksberg of its worth ever since. In an initial phase, CBS purchased 12 sets consisting of a hand microphone, headset and charger for its small and medium-sized classrooms. Over the course of the full digitization programme, all lecture theatres and classrooms together with all lecture halls are to be equipped latest by 2020 with Sennheiser's digital microphone technology. With more than 21,000 students, 1,500 employees and an excellent reputation, the Copenhagen Business School is one of just 76 universities world-wide with the "triple crown" accreditation. Having a modern infrastructure is mandatory at CBS. For example, all computers used by the university are replaced with the latest model every three years. In 2012, CBS started equipping their largest lecture theatre (600 seats) with Sennheiser wireless microphones. The microphones used previously, from another manufacturer, often had drops in signal over longer range. The challenge was that the sound engineers from the Business School wanted the microphone receivers to be kept in a separate room and not rack them in the hall. The Systems of Sennheiser EW 300 and EW 500 still work smoothly in the big theatre, so CBS does not see a reason to make a change at the moment. The situation is somewhat different in the smaller and medium-sized classrooms, which provide space for up to 80 students. In the past, these rooms had no voice amplification. The lecturers at CBS have started using wireless microphone systems even in the smaller rooms on the campus - a knock-on effect of higher student numbers. A new situation was created when the lighting in these rooms was updated to dimmable LED technology: "We suddenly had frequency problems with the analogue mics," reports Jens Nielsen. On top of that, the conventional gooseneck microphones no longer worked properly. The university had combined the gooseneck microphones with the wireless microphones of the EW series; the battery capacity quickly reached its limits. In response Jens Nielsen visited a local AV fair to find a new wireless solution for his gooseneck microphones. While watching a demonstration at that event of the new SpeechLine Digital Wireless series, Jens Nielsen realised that Sennheiser's new product line could actually be ideal for medium-sized classrooms, and he also realised that the university's in-house wireless solution for its gooseneck microphones was perhaps not as originally intended by the designers. Nielsen actually left the fair with something completely different than he planned to: he ordered the SpeechLine Digital Wireless microphone system instead of new gooseneck microphones. The change-over to wireless gooseneck microphones is now planned for 2018. 33 SpeechLine Digital Wireless microphone systems were installed by the Copenhagen Business School's own AV specialists without the help of Atea, their integrator. "Handling is extremely easy, the products work perfectly," says Nielsen. The transmission range is also excellent and the capacity of the integrated rechargeable batteries has so far been sufficient for every event. Whether the capacity is actually the promised 15 hours has yet to be tested in practice - the microphones and receivers at Frederiksberg are placed in their charging cradles overnight after every use. At CBS, the microphone signals transmitted by the SpeechLine DW products are picked up by a small digital mixer (Extron) - just one more advantage compared with the analogue products, in Jens Nielsen's opinion. The use of the digital mixers is generally minimal and is successful in avoiding feedback, which was not always the case for the analogue systems. At the Copenhagen Business School, one thing is a definite: parallel to the conversion of all classrooms in all four buildings to digital technology, the microphone technology deployed at the campus as a whole will be converted over the long term to SpeechLine Digital Wireless. In 2018 the largest lecture theatre is scheduled to be refitted with 20 new microphone sets together with LED lighting. By 2020 every single hall at the university is to be fully digitised. Although Ikea-effect buys may also happen.